Foxes denning under your deck? Or denning in your yard? Or, maybe you’re just seeing them around and wonder if you should be concerned.” Well, the good news is that you have nothing to fear. If they’re raising a family in your yard, you’re in for a treat. 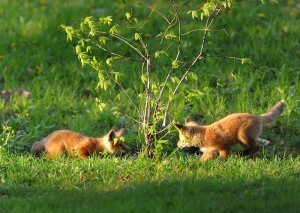 It is fun and educational to watch fox parents raise their young. No, foxes won’t drag off your kids — their main prey items are mice, rats, chipmunks, and some squirrels or rabbits. They are not interested in you or your family as food. Fox kits play like puppies and will entertain you for hours. If the foxes are acting too tame, chances are they’re just accustomed to suburban life. You can change that by yelling, waving your hands, banging a pot with a spoon, or spraying them with a hose. Try tossing a soda pop can filled with a hand full of pebbles or pennies in their direction…they’ll get the message quick! When you absolutely must get rid of foxes or evict them from your yard, start by assessing the problem. Look for what may be attracting them. The answers will enable you to solve and prevent fox problems. Killing or relocating foxes will not solve the problem, and may be illegal in your area. Other foxes will soon discover the same things that attracted the current ones. Lethal traps and poisons are also not workable solutions. In addition to being cruel and outdated, they’re hazardous to children and pets. 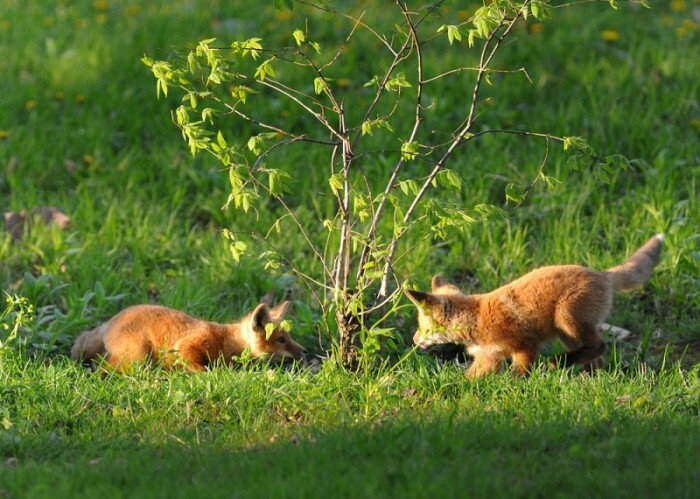 Experienced homeowners have found that non-lethal approaches and targeted prevention measures work best to discourage fox from taking up residence. Foxes are not a danger to humans except in very rare instances when one is rabid, or when they are cornered. Under such duress, a captured fox may bite. Healthy foxes prefer to avoid people, and certainly don’t view people –or children – as a food source. If you see one in your yard, either make loud noises or begin an activity in your yard and the fox will most likely move along. Foxes use dens for resting and shelter from weather at any time of year. Kits are being raised in dens usually from March to June. If possible, wait until you see the kits playing outside the den to try to evict them, as they will then be ready to follow their parents elsewhere. If you can’t wait for that, try harassment. Loosely place straw, leaves, mulch, or soil in the opening. Replace the loose material each morning until it remains in place for a few days. At that point, the foxes will have moved along. 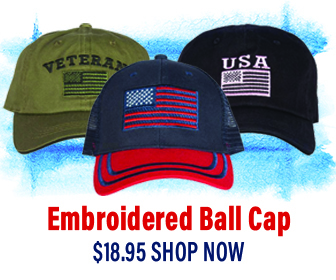 If those materials do not work, try urine soaked cat litter, a sweaty T-shirt, or sweaty socks instead. Another harassment technique is to attach Mylar balloons or 1.5 ft. lengths of Irri-tape® to dowels or garden stakes 24 to 36 inches off the ground just outside the entrance of the den. Whatever method you use, make sure all kits are out before you seal up the area to prevent future use. To determine if the fox family has left, block the hole loosely with wadded up newspaper. Leave in place for two to three days. If it remains undisturbed after that time, it is safe to assume they have vacated the area. 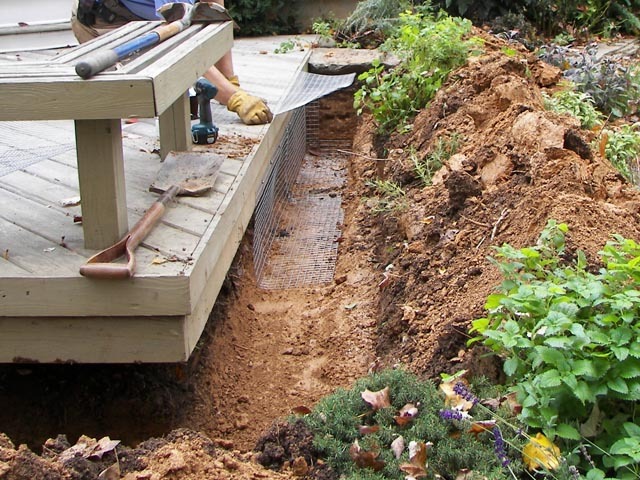 Bury an L-shaped footer around perimeter. Dig a one-foot-deep and one-foot- wide trench and place an apron of wire mesh fence material with openings three inches or smaller–straight down, then outward, away from the fence. As simpler, less laborious solution is to take that same L-shaped apron and run along the surface of the ground and secured with landscaping staples. Products sold for repelling domestic dogs are likely to repel foxes. Sprinkle the repellent around the garden or yard and reapply after rain or watering. When foxes are trying to feed kits, they may view kittens, small house cats, and toy dog breeds as possible prey. Cats should be kept indoors to protect them from other hazards like cars and disease and to keep them from adding to the toll on songbirds and other wildlife. Monitor very small dogs when outside; they are often targets of dog-nappers, potential prey for large raptors, and can easily squeeze through small opening in fences and escape. Following these precautions for cats and dogs will also protect them from interactions with foxes. Rabbits, guinea pigs, and chickens kept outside should be in a shelter with welded wire mesh, a solid floor, and a lock. Although foxes generally pose no threat to humans, you should not approach or attempt to touch them. Contact your local animal control or your local police if you see a fox exhibiting possible signs of rabies: circling, partial paralysis of limbs, staggering, self-mutilation, aggression, and unusual tameness. Sarcoptic mange, which can cause moderate to severe hair loss and even death in foxes, is not a threat to humans.